This has been a long joint project and we are pleased with the results and hope the resources are useful – and enjoyed. If you do not get your resources from TES, you can find the ‘long and short of it’ versions here. 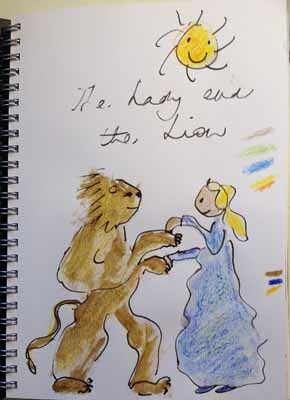 This entry was posted in Child language, Competence level, Grammar, Helping children understand, Inference, Promoting language development, Share stories, Speech & Language Pathology, Speech & Language Therapy and tagged Getting meaning from pictures, language development, Pip Harrison, S&LT, SLP, The Lady and the Lion. Bookmark the permalink.